Adhyatma Prakasha Karyalaya is happy to place in the hands of the readers a unique two part book that contains all the six chapters of the Second Book of Aitareya Aranyaka. 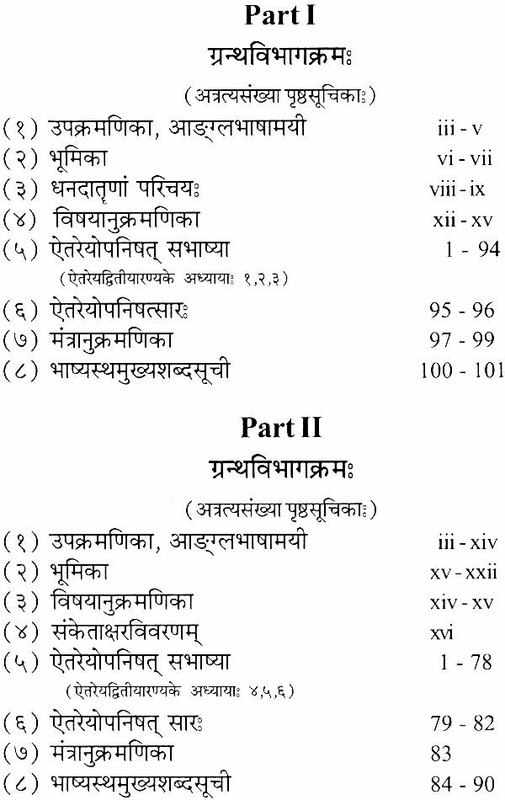 The Aitareya Aranyaka of the Shakala School of Rigveda consists of Five Books, each called an Aranyaka. Of these, the Second Aranyaka has six chapters and is called by the name ‘Bahvrcha-brahmanopanishad’. It contains meditations on Prana in the first three chapters and knowledge of the Self in the last three chapters. The portion of the Second Aranyaka dealing with the Knowledge of the Self is customarily called as Aitareya Upanishad. It is well known that there exists a Shankara Bhashya for this portion of the Second Aranyaka. 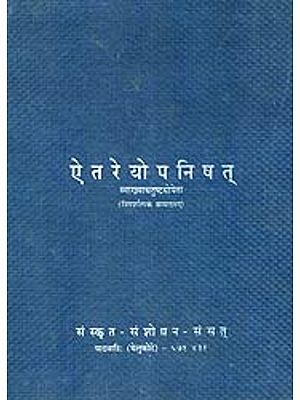 The Karyalaya has published during 1945, the Aitareya Upanishad with the Bhashya edited by H.H. Sri Satchidanandendra Saraswati Swamiji. This edition included Swamiji’s Kannada translations, a scholarly introduction, short notes, summary of the chapters and many other facilities for the reader. This book has been reprinted twice, during 1975 and 1993. In his introduction to the above book, Sri Swamiji stated that it is probable that Sri Shankara wrote commentary for all the six chapters of the Second Aranyaka, and advanced several reasons for the same. For more details on Swamiji’s reasons, the readers are referred to the Bhumikas in Sanskrit or the Preface in English, in the present book. Sri Swamiji also stated that he was in possession of a hand written manuscript titled ‘Sri Shankaracharya Krita Bhashyam’, comprising a Bhashya on all the six chapters. In that manuscript, the Bhashya for the last three chapters is same as the now famous Shankara Bhashya on the Aitareya Upanishad. However, Sri Swamiji refrained from publishing the manuscript immediately, as in his opinion, the authenticity of the Bhashya for the first three chapters in the manuscript as well as in additional manuscripts which might come to light in future needed to be carefully examined before deciding to attribute the Bhashya to Sri Shankara. The Karyalaya reverentially holds on to the Swamiji’s view. In the opinion of Sri Swamiji, however, it is essential to read all the six chapters of Second Aranyaka as a whole in order to understand the Upanishad Bhashya. This is because Shankara in his discussion has considered the contents of the six chapters as a whole. Also, the relationships of the first three chapters are seen to have been discussed in the Bhashya and several statements from them are quoted in the Bhashyas on other Upanishads and the Brahmasutras. Therefore, the Karyalaya thought it beneficial for the reader if all the six chapters of the Book are printed as a single book. The present book has been brought out in Devanagari script for the benefit of readers not knowing Kannada, and it contains two parts. The first part contains the first three chapters along with the Bhashya found in the manuscript. 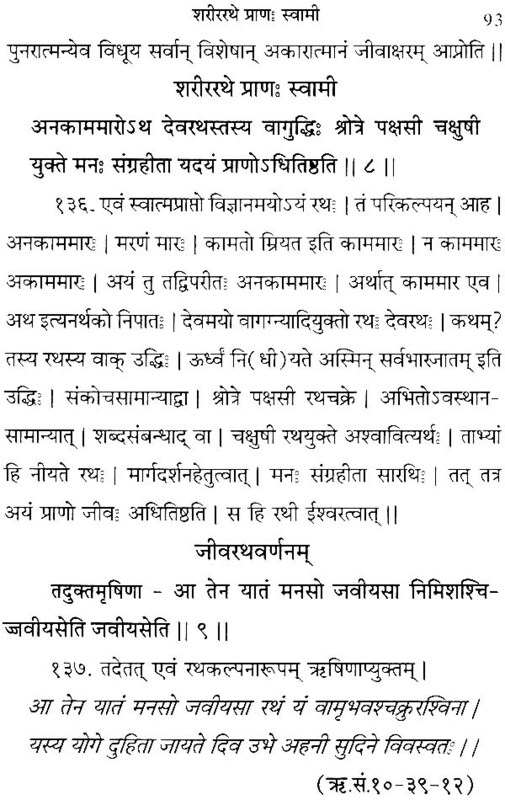 The titles ‘Bahvrcha- brahmanopanishad prarambhah’ in the beginning of first part and ‘Aitareyaopanishad’ for both the parts are used as these terms are in vogue. The title ‘Sri Shankara Bhashya Sametha’ in the beginning of the first part is as per manuscript. This part, however, contains minimum facilities in terms of short notes, etc. The second part of the book has all the facilities like an introduction, short notes, summary of chapters, lists of mantras and words, etc., as in the Kannada edition. The Bhashya parts numbers here are same as found in the Kannada edition. It is important to note that these numbers are kept independent of similar numbers in the first part. The readers may also note that two different chapter numbers are indicated at the top right hand comer of the pages in the second part. One of them is exclusive to this part, treating the chapters in this part as 1, 2 and 3. The other is in the Aranyaka order, according to which the chapter numbers in this part are 4, 5 and 6. The Karyalaya expresses its profound gratitude to all the saints, scholars and others who have rendered selfless services in bringing out this volume. Sri Nataraj K Hulamani has done an excellent composing job. Printing is by Sri Rama Printers. May the blessings of Sadguru shower always on all of them. We solicit the opinion of discerning readers on this book and on all the activities of the Karyalaya. We conclude this note remembering the lotus feet of Sri Swamiji who rendered a yeomen service in the field of Vedanta and laid a firm foundation in the form of Adhyatma Prakasha Karyalaya for its propagation. 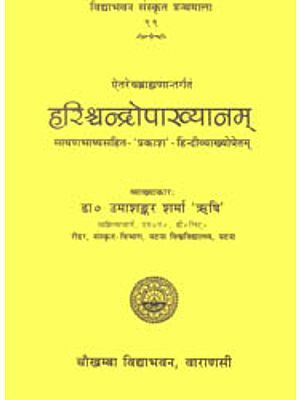 The present edition of Shri Shankaracharya’s Bhashya on the Aitareya Upanishad is intended for readers who wish to have the plain text of Shri Shankaracharya’s work unencumbered by commentaries and sub-commentaries, but provided with such aids to study as a beginner is likely to need in appreciating the original. The Aitareya Upanishad Bhashya edited by H.H. Sri Satchidanandendra Saraswati Swamiji has been published earlier by the Adhyatma Prakasha Karyalaya in Kannada script along with Swamiji’s translation of the same into Kannada language and along with an introduction, short notes, summary of the Upanishad etc. The Kannada edition has since undergone several reprints. For the benefit of the readers not knowing Kannada, this edition of Aitareya Bhashya is brought out in Devanagari script for the first time by the Karyalaya. The Aitareya Upanishad is one of the ten principal Upanishads which have been commented upon by Shri Shankara Bhagavatpadacharya. This Upanishad forms part of Aitareya Aranyaka of the Shakala school of the Rigveda. The Aitareya Aranyaka consists of five books each called an Aranyaka. Of these five, the Second book contains meditation on Prana (first three chapters), knowledge of the Self (next three chapters) and Shanti mantra (last chapter). The Third book contains meditation with regard to Samhita texts. According to Sayanacharya etc. the whole of the second and the third book compositely form the Upanishad, the third book being specifically called the Samhita Upanishad. However, the portion dealing with the knowledge of the Self i.e., the fourth, fifth and sixth chapter of the second book is what is customarily called Aitareya Upanishad and the Shankara Bhashya in currency is for this portion. The Bhashya on these chapters is what is being taught and learnt, printed and published, discussed and discoursed upon. Certain points culled out from the scholarly and highly informative introduction provided by the Swamiji is briefly given hereinafter. Is The Extant Bhashya Complete? From this a pertinent question arises - What is the extent of the Upanishad for which Shri Shankaracharya has written his commentary? Does the original Bhashya commence from the fourth chapter of the Second book as is presently widely believed to be, or does it commence from the very start of the Second book? i. Therefore, this knowledge of the Para Brahmatman is verily the Path, is verily the Karma, is verily the Brahman, is verily the Truth - Bhashya on (Ai. Ar.2.4.2). This is in the context of citing the text ‘the Devatas also fall within the sphere of samsara as the reason for the earlier text appearing at the beginning of the Second book. While commenting on this Bhashya sentence, the sub-commentator, generally believed to be Anandagiri (whose indentity is discussed later) says Though while explaining this sentence path of karma is also comprehended as the meaning for the word (path), it is only in the sense of it being the means for the path of knowledge and not in a fundamental sense). From this it can be said that the subcommentator considers that the Bhashya commenced from the start of the Second book itself. ii. The Prana is the conglomerate of organs, so we said at the start of ‘conversation amongst the organs’ (Ai. Ar. 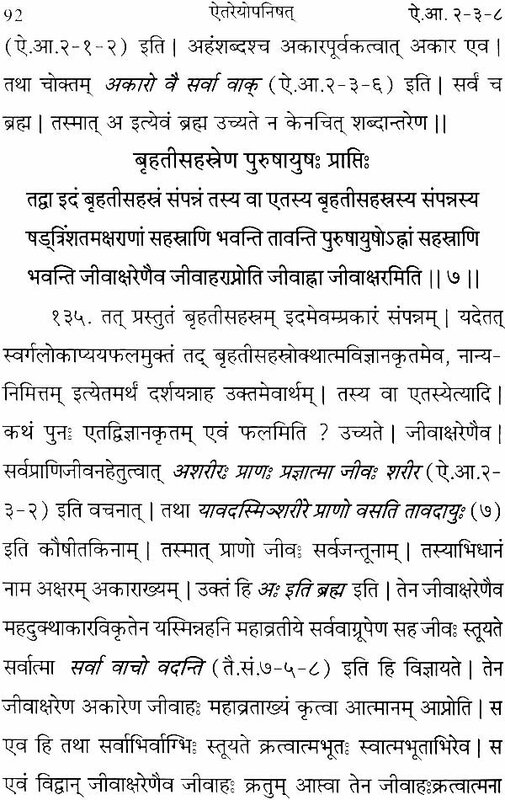 2.1.4) Bhashya at part 86. This is the reference made to the acceptance of Prana, by all the organs, as the ‘uktha’ (literally the panegyric, contextually the principal) and their dependence on Prana. The words so we said’ gives sufficient room to speculate that Acharya had commented upon that part of the Aranyaka also. Moreover, in the extant Bhashya, the contextual relationship with the earlier three chapters is frequently discussed. Certain texts from this part are also cited in the Bhashyas of other Upanishads and Brahmasutras. This strengthens the view that Acharya has probably commented upon the earlier three chapters also. Further, the Aitareya Upanishad is customarily referred to as Sextet of Arman. If one considers (Ai. Ar.2.4.1) as the commencement of the Upanishad, then, the appropriateness of the name becomes questionable. Neither are there six chapters nor six khandas to justify that name. If it be said that the seventh chapter commencing from be also included to complete the sextet of khandas, then the question arises why not the Upanishad be named as Quadrapule on Atman on the basis of four chapters; also why the Acharya has not commented upon this concluding part needs to be answered. Therefore, in all fairness, it will be only appropriate to conclude that the earlier three chapters and the three chapters for which the extant Bhashya is there, together earned the name being devoted to the inquiry of the Para and Apara Brahman. As if to support this, revered Swamiji states in his introduction to the Kannada translation of Aitareya Upanishad Bhashya that he has in his possession a hand written manuscript titled ‘Shri Shankaracharya krita Bhashya’ comprising Bhashya on the whole of the first six chapters of the Second book. In that manuscript, in addition to the Bhashya on the earlier three chapters, the extant Bhashya on the subsequent three chapters is also found. Shri Swamiji further states that he refrains from publishing the Bhashya on the earlier part in the hope of additional manuscripts from different sources. However this may be, in light of whatever has been said above, in order to understand the Bhashya, it is essential to read all the six chapters as a whole. It is clear that Acharya in his discussion has considered the contents of the six chapters as a whole.